We are finally just hours away from resuming Green Bay Packer football. It seems as if the Green Bay Packer bye week has lasted longer than two weeks. I feel like we have been sitting around for what seemed like a month; waiting with bated breath for the Green and Gold to come running out of the Lambeau Field tunnel. Yes, I guess you could say that it is the grand reopening of football season in Green Bay Wisconsin. You may be asking yourself, what on earth is the reason for all of this uptempo optimism oozing from this article. The answer is quite simple, the absence of Packer games from the NFL’s Rolodex of games, makes the heart grow fonder of the Green and Gold. Another reason for the optimism going into this week is that Mike McCarthy is 9-2 coming off bye weeks. This game against division rival Detroit is a must-win game, and I believe that McCarthy has emphasized playing with a sense of urgency during this week of practice. I believe that the Packers must get back to basics for this weeks contest against the Lions. They will need to run the ball frequently and efficiently so that they can attack the Lions with their passing game from a position of strength. Defensively, I think Dom Capers must simplify the defensive strategy to ensure that there will be fewer miscommunications with defensive assignments in the secondary, and a greater emphasis on ball pursuit. The Packers front seven must penetrate the Lions offensive line and stifle the run and be able to get consistent pressure on Matthew Stafford. The key to executing both the offensive and defensive game plan this week is not a secret. The Packers must win the battle of the point of attack on both sides of the football. If they are able to find a way to win the battle at the point of attack, Aaron Jones, and the Packers rushing attack will be able to run the ball 30 times and average significant yards per carry, which will limit the number of possessions that Matthew Stafford and the Lions offense will have. 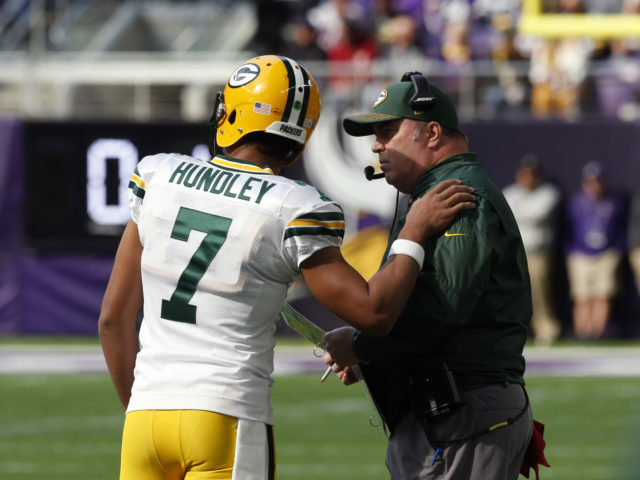 Mike McCarthy will also need to provide Brett Hundley with safer reads when in the passing game. Brett should remain very conservative with his pass attempts, looking to set up the screen game and utilize the big targets of Lance Kendricks and Richard Rodgers. McCarthy should look to build Hundley’s confidence with high percentage pass attempts and a steady diet of Aaron Jones and Ty Montgomery in the backfield. Look for the running back tandem to carry the ball 25-30 times this week. I expect to see a more consistent and dependable effort from the offensive line since the success or failure of the offensive attack will end up on the heels of the play up front. Look for McCarthy to make more of a concerted effort to run the ball consistently throughout the game with Jones, Montgomery, and Hundley (with both draws and the read option). A successful performance from Brett Hundley and the Packers offense will see Brett’s passing attempts limited between 17 and 22, with many of them being high percentage passes to running backs and tight ends. This will then allow Hundley to take his limited shot plays using the seams down the middle of the field, with slants and sideline outs on designed rollouts. I will be looking for a simplified, back to basics kind of approach that will see teamwork employed through effective communication, gang tackling, and a team effort of rallying to the ball. I will be looking for the front seven to finally win the battle of the point of attack up front, and stifle the Lions running attack, apply pressure, and finish sacks. Finally, I will be looking for the defensive backs to keep plays in front of them and communicate effectively on their assignments. I would like to see Dom Capers limit his exotic packages and just simply focus on run/pass containment and ball pursuit. The Green Bay Packers defense must help reclassify the NFC North as the “black and blue” division and get back to playing smash mouth football. I see the Packers rallying against all odds, to pick up a much needed, hard fought 20-17 win against the division rival Detroit Lions. This entry was posted in David Michalski and tagged 2017-2018 Green Bay Packers, Aaron Jones, Brett Hundley, Dave’s two minute Pregame Primer, Packers vs Lions 2017. Bookmark the permalink.